This week I was supposed to start doing kick counts every day. The intent is to count how long it takes for the baby to move ten times, and if I'm unable to feel ten kicks within two hours, then I'm supposed to contact the midwives' office. I made it about three days of duly counting kicks before I realized writing down each kick didn't make much sense - especially the one day that I counted ten kicks within about three minutes :) So now I'm thinking the intent is less to actually write down every movement felt and more about just paying attention for a set period of time each day, just to tune in to what the baby is doing and make sure I feel consistent movement each day. So I'm doing that now, mainly in the mornings since that seems to be when the baby is most active the longest, and so far so good. 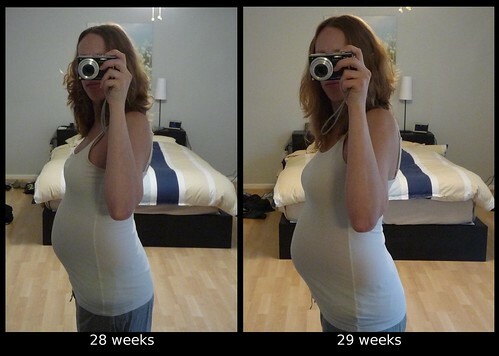 I received the results back from my appointment with the midwives last week, and while I passed the glucose test (yay! ), it turns out I tested positive for Group B Strep. This generally isn't that big of a deal in the sense that the percent chance of it infecting the baby is pretty minuscule (<1%), but since the risk is present (and the potential impact to the baby can be serious), I'll likely be going on antibiotics now (pending the results of my retest) and then getting retested at 36 weeks. If I'm positive then too, then I'll need to be on IV antibiotics during labor, which will lead to some changes in how we had hoped to labor (e.g., we'll have to go to the hospital earlier than planned and I'll need to be hooked up to an IV for about 15 minutes every four hours), but our childbirth instructor and doula have both assured us that the birth we're hoping for is definitely still possible, it just will have a few minor obstacles now that we know up-front we'll have to deal with. In other fun news, I'm now waking up 1-2 times a night to go to the bathroom. I guess it was only a matter of time before that symptom caught up with me :) I also decided to switch to organic lotions a few weeks ago, and in trying out different types, I had ordered some cocoa butter. I have no interest in its supposed ability to counteract stretch marks (since I've heard that's all determined by genetics anyway and the cocoa butter won't affect that), but I thought I'd try it since it seems to go hand-in-hand with pregnancy anyway. Little did I know it's a hard, colorless, solid mass that I have to scrape out of the container with my fingernail - and also, little did I know just how amazingly delicious this stuff smells :) Since the smell of chocolate used to turn my stomach, that was another surprise for me - I have to remind myself it's basically just chocolatey-smelling Crisco just about every night to try to convince myself not to eat some (although that hasn't stopped me from trying to peer pressure Ryan into eating it instead).